Honeycrisp Apple is one of DavidsTea’s fall collection teas, so if you’re interested trying it, it is a limited edition tea. Being a huge fan of the actual Honeycrisp apple fruit, I was curious about this tea. When I first smelled it in store, it was clear why DavidsTea named it the way that they did because the apple aroma is quite powerful and it smells like it will be a sweet fruit. The ingredients are visible, with the pieces of fruit and the dried blackberry leaf. At first glance of the ingredients, I thought this would have been an herbal infusion instead, but it does actually have tea. The ingredients of Honeycrisp Apple are: apple, sweet blackberry leaf, green tea, hibiscus, apple pomace, pear, natural pear and apple flavouring. The recommendation for Honeycrisp Apple is to steep for 3 to 4 minutes in 85°C (185°F) water. I opted to steep mine for about 4 minutes. When steeping, Honeycrisp Apple smells amazingly like apples, with underlying notes of floral sweetness. I don’t actually smell any green tea but given where it falls on the ingredients list I’m not entirely surprised. 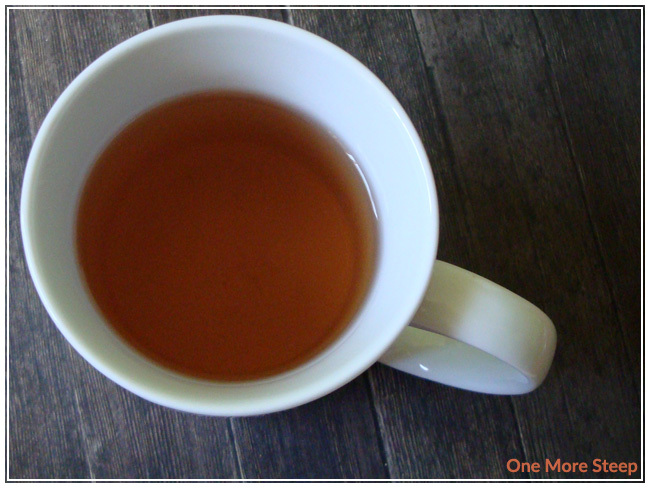 The colouring of Honeycrisp Apple after steeping is that of a nice rich apple cider. Between the familiar apple cider colour and the great aroma of apples that I can waft up from my cup, I’m more than a little excited to try this tea. On the first sip, I am pleasantly surprised! While it doesn’t taste as sweet as it smells, the tea has a very good apple taste to it. The tail end of each sip has a bit of a sour apple note to it, like with Granny Smith. But because Granny Smith is still an apple, it’s a very nice taste to it. I wound up adding a bit of sugar to Honeycrisp, and it does brighten up the flavour. There’s still that sour apple taste to the end of each sip, but it’s more pleasant with the addition of sugar. I tried resteeping it and I wound up with a cup of weak flavoured apple water. Honeycrisp Apple is only good for one steep. Although, I’m not surprised it didn’t do well on one more steep, because often teas with a lot of herbal ingredients just don’t do that well. 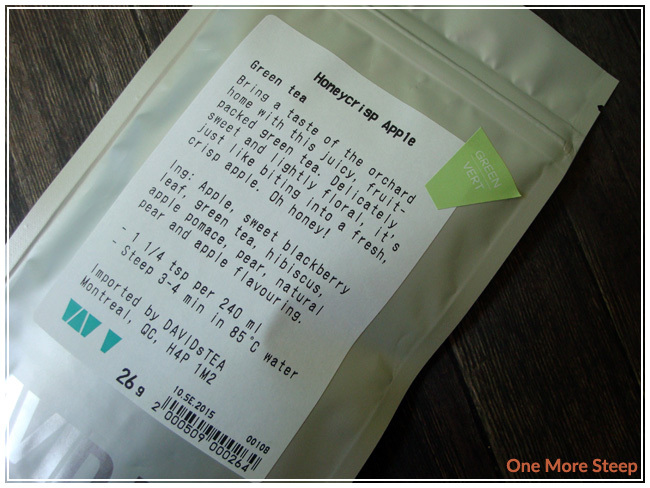 I loved DavidsTea’s Honeycrisp Apple. While I don’t necessarily think that the name is the best for the tea (it reminds me a lot more of an apple cider or reminiscent of biting into a Granny Smith), it is a really nice tea. The flavour brightens up a lot with the addition of a spoonful of sugar, and the Honeycrisp Apple tea itself is really pleasant and enjoyable. I think it would taste even better with the addition of cinnamon, to make it into more of an apple cider alternative. 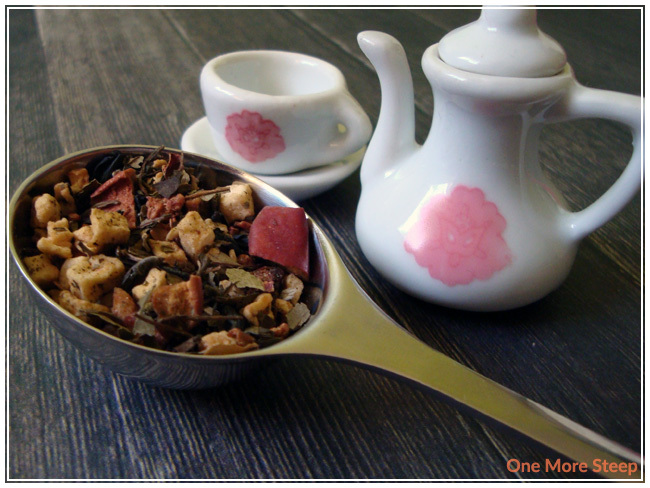 It is a very cozy-feeling tea and would make a great tea to have while cuddling up on a couch or having around a campfire.